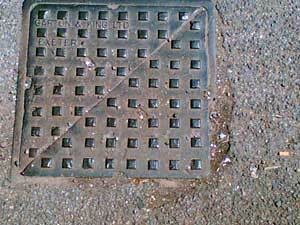 SQ1 Square cover diagonally divided – Exeter. 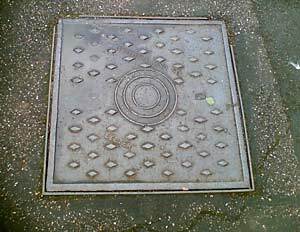 SQ2 Standard large cover, Exeter. SQ3 St Thomas Pleasure Ground. Very early G & K with “Engineers” tag. The grounds opened in 1891 so this might date from then. There is no “Limited”. 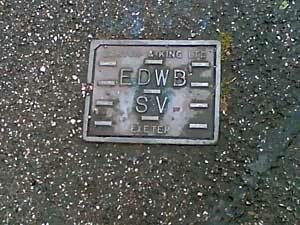 SQ4 East Devon Water Board Stop Valve Cover. 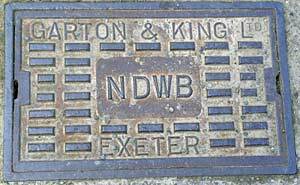 SQ5 North Devon Water Board. 17” width. SQ6 Torquay Station. 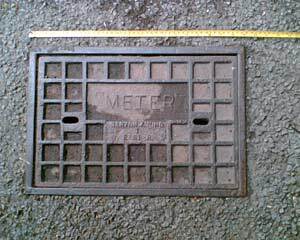 Meter box Cover 19” width. SQ7 Inspection Cover. 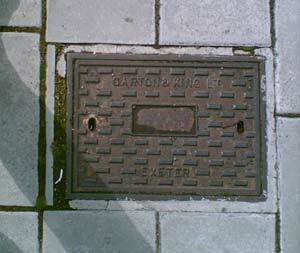 In pavement near Malt House Inn, Exeter. 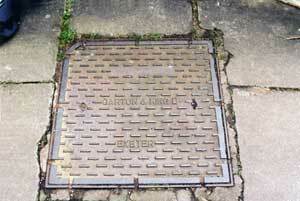 SQ8 Large inspection cover with skewed raised lettering and Target Style central rings. Little Silver near St David’s Church Exeter. 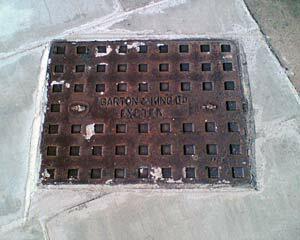 SQ9 Dated lettering on top edge and no “Limited” (pre 1924) in Crediton High Street. 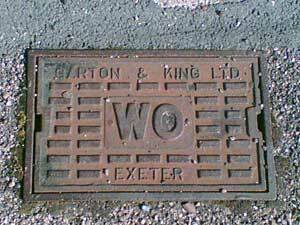 SQ10 Any Ideas as to what WO means – Water Outlet ??? 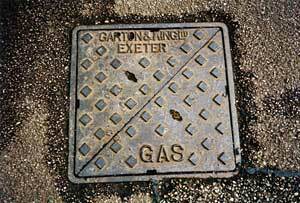 Exeter. 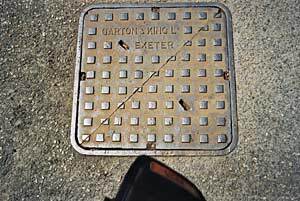 SQ11 St Thomas Exeter – Diagonally divided large square cover. Name only on one triangle. SQ12 The lettering like SQ 8 is skewed but in a mirror image to the Little Silver Cover – otherwise identical. Exeter. 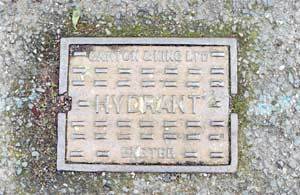 SQ13 Mucky standard Cover with central Lettering. Sherborne, Dorset. SQ14 Almost the same as SQ 1 except the “Exeter” and the raised square location in that area is different. Exeter. SQ15 Different variation to pattern and lettering layout. Exeter. 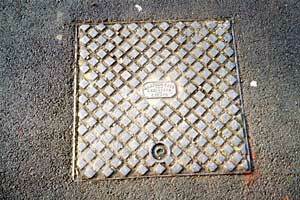 SQ16 A Manhole spotters Red Letter Day !! 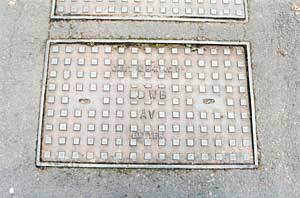 Two pre 1924 (without the “Limited”) side by side adjacent to the OLD Royal Devon & Exeter Hospital in Southernhay. Exeter. Dated old style of lettering. 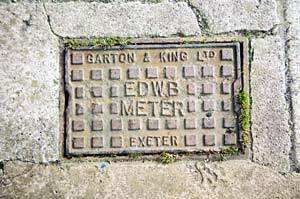 SQ17 We can’t have a section on Square & Rectangular Covers without an appearance of my shoe so here we are just getting a look in on a CONFUSED East Devon Water Board Meter Cover. Which way ‘round is the right way ‘round? 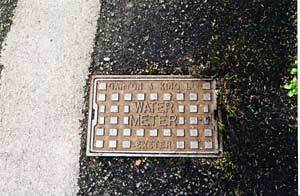 SQ18 Everything facing the right way for the East Devon Water Board. 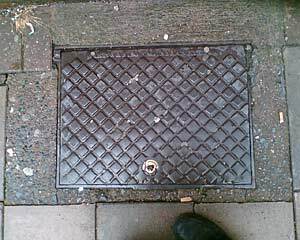 SQ19 Large Cover – Angled corner. Exeter. 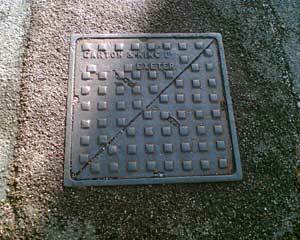 SQ20 Diagonally divided cover – GAS on one triangle. Exeter. 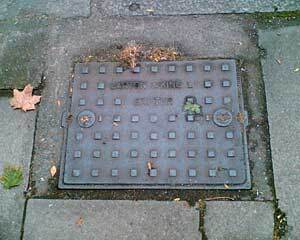 SQ21 Pre 1924 and dated lettering Airtight Inspection Cover. 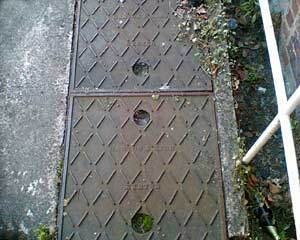 With the circular grabs concreted over not so easy to get up !! Exeter. 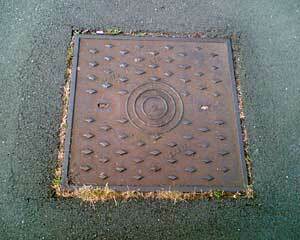 SQ22 Slightly anglerd corner cover variant.. Butts Road, Exeter. 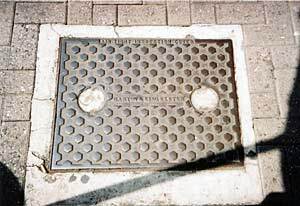 SQ23 The Seen Almost Everywhere Hydrant cover. Often daubed in yellow! Exeter. 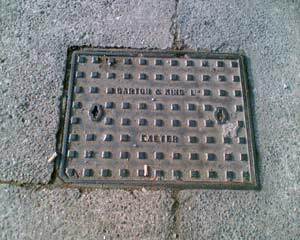 SQ24 East Devon Water Board “Air Valve” Cover (?) Nr Beech Avenue, Pennsylvania, Exeter. 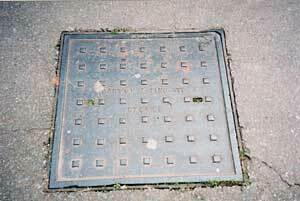 SQ25 Standard Water Meter Cover Exeter. 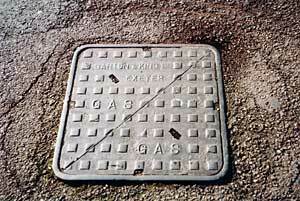 SQ26 Diagonally divided Gas cover, GAS on both sections. 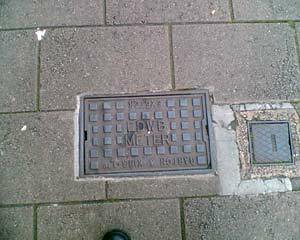 A reminder that WILLEYS did not have the monopoly for Covers - this one was most appropriately found in the middle of Willeys Avenue, Exeter ! 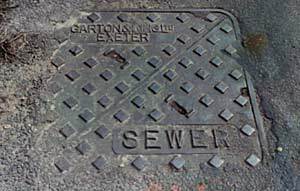 SQ27 Most puzzling - on the back of the photograph of this unusual SEWER Cover is the word JORDAN. It is possible that my father visited Jordan and found it there.